As you stand determined in your wasteland garage, decorating every possible nook and cranny of your vehicle with the skulls of your enemies whilst a soft guitar soundtrack hums away in the distance, you might think to yourself that this all seems a bit familiar. Yes, Crossout may just be the closest we’ve ever come to a Mad Max vehicle crafting-simulator (outside of 2015’s licensed game, that is), but that’s alright in our books. With an emphasis on pure destruction and chaos, your sole objective is to create a bigger and more badass vehicle than your opponents, and blow them straight to the gates of Valhalla as you duke it out in the dusty hellscape. 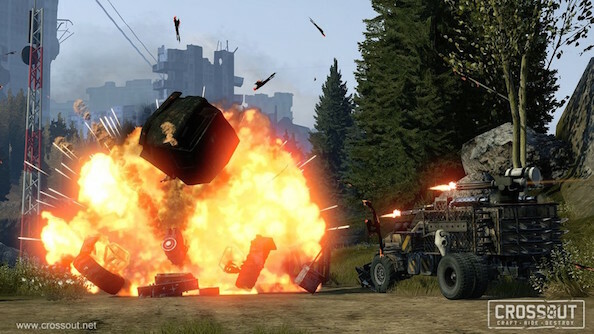 From the teams behind War Thunder and Star Conflict, Crossout contains an absurd amount of customisation to sink your teeth into, and features up to eightplayer PvP battles, so expect plenty of ridiculous vehicular mayhem. We’ve got 1,000 keys for the Closed beta to give away, and all you need to do for a chance to win is enter via our widget below. The more actions you do, the more entries we’ll throw in and the more chances you’ll have to win. We’ll also need your email address, but only so we can send you your code should you win – no spam, we swear! You will then be sent an email to download the client… and start playing! Please note that the keys for the closed beta will need to activated by October 23rd or they will become invalid. And because you know you want to, pop on over to our Facebook page and give us a like, and we’ll keep you in the know with all our future giveaways.